A look back at eLife's achievements in 2016, notably in advocating for more open practises in sciences, building an open infrastructure for research communication and supporting early-career researchers. The close of 2016 marks an important landmark for eLife as we transition into our second five-year term. Our first five years focused on building a scientific brand associated with research excellence, transparency and publishing innovation. With the announcement in 2016 of the renewed support from eLife’s founders, we now move into a second phase where we begin to capitalise on our achievements to date to have broader influence on research communication and achieve our mission to help scientists accelerate discovery. When considering the current and future influence of eLife, we can look at a number of dimensions. Our core activity is our journal and in 2016 we published over 1,000 research articles for the first time. As eLife approaches the 5th anniversary of publishing, we have been able to grow rapidly and scale an editorial process that gets important work published constructively and quickly. And the array of work that we publish continues to encompass the full breadth of biomedical science: amongst 2016’s highlights were the ancient history of viruses, drought-resistance in plants, the neuroscience of anxiety and the demographics of human height. Complementing the science, we have also published influential feature articles, covering topics including the benefits of taking a more open approach in the communication of research outputs. With a strong scientific and editorial foundation, we see tremendous prospects for further growth of eLife’s publishing over the coming years. Our work with early-career researchers has also gathered momentum in 2016, and it remains a high priority for us to support and learn from this segment of the scientific community. The cultural change that eLife is attempting to foster in science will only be achieved in the longer term, which is why our work with early-career researchers is so important. Amongst many other initiatives, in 2016 we recruited several hundred early-career reviewers to participate in eLife’s unique editorial process. This initiative provides an opportunity for early-career researchers to gain experience of peer review, and to share their own valuable insights with other colleagues. Another dimension of eLife’s impact is progress in technology development. In this area, our goal is to be at the heart of an ecosystem that is driving a more open approach to science. Open infrastructure will be a key part of this and during 2016 we dedicated a little over £1 million of our funding towards the creation of a complete open-source publishing toolset. The first phase of the toolset - named Continuum - was completed in February 2016 and the second phase has just been released. This unique suite of tools will provide eLife with state-of-the-art technology to underpin and explore radical improvements in the design and presentation of content. The tools are also freely available as open-source software for anyone to use. For too long, publishers and suppliers have competed on proprietary solutions to support research communication, with the result that there is much duplication of effort and unnecessary expense. With growing support within the publishing community for open-source software, we hope that Continuum will be adopted as one of the core components of an open and collaborative research communication infrastructure. For too long, publishers and suppliers have competed on proprietary solutions to support research communication, with the result that there is much duplication of effort and unnecessary expense. There is much more work to be done in the area of product and technology development, and the eLife Board is delighted to see the collaborations that are developing between eLife and established entities such as Hypothes.is. In addition, new early-stage projects are also being identified and selected for collaboration with the eLife team. As above, the common theme that connects all these efforts is a commitment both to open science and to open source software. With respect to longer term financial sustainability of eLife, important progress was also made in 2016 as we laid the groundwork for the introduction of publication fees in January 2017. By transparently explaining the basis for the calculation of the fee, we have seen an overall positive reaction to the introduction of the fee. Submissions dropped slightly in the first three months of 2017, but at the time of writing, we have already seen a recovery to previous levels. The fee will cover the costs of journal growth at eLife, so that more of the eLife’s funding can be used to support other activities, including our efforts to make science more accessible to a broader audience and more useful for others to build on and make discoveries. eLife is motivated by the potential to make science a more transparent and collaborative enterprise. As a multidisciplinary partnership ourselves, between funders, researchers, publishing teams, developers, designers, and other organisations, eLife is being as transparent and collaborative as possible to help open up science for the World. The inexorable progress towards open access to research outputs of all types is creating a vast and rich collection of information that can be used for knowledge discovery. To get the most out of these resources, there is a need to develop new tools and services to navigate, interrogate and use the information. eLife therefore invests a substantial fraction of our funding into innovation and technology development and in 2016 we launched the first phase of a major software development project – a suite of tools to support open-access journal publishing. Dubbed Continuum, these tools allow eLife to take complete control of our website, and are also freely available as open-source products for anyone to use. We have recently completed the second phase of Continuum, which supports a very powerful approach to the design of journal websites so that new findings can be organised and presented in the most useful ways. As well as building new tools, we collaborate with other projects where there is a commitment to open-source software and open standards. In 2016 we announced a collaboration with Hypothes.is aimed at providing annotation and commenting tools that are geared towards the needs of scholarly communication. We also created a new post within our staff to identify ideas and early-stage projects that have the potential to address an important research need. We showcase projects on the eLife Labs page, and will help to launch prototypes for selected projects. eLife also supports the development and adoption of community standards for information sharing, which will help to enrich the network of research outputs. Specifically, in collaboration with other publishers we have encouraged the use of identifiers for people (ORCID) and resources (RRID), and are helping to improve the consistency of article formatting to support more effective text and data mining (JATS4R). To achieve the transformation of research communication that eLife is striving for will require a concerted effort from all of the key stakeholders. Journals and publishers can work together, for example, to encourage or require the use of new community standards and approaches. In addition to building ORCIDs and RRIDs into our publishing processes, eLife is also collaborating with bioRxiv to encourage the posting of preprints (versions of an article which have not yet been peer-reviewed) which helps to accelerate the availability of new findings. Thanks to the advocacy efforts of ASAPbio, there is steadily increasing interest in preprint sharing amongst life scientists. eLife also collaborated with a group of journals and researchers on a simple methodology for sharing the citation distributions that underlie impact factor calculations. The resulting article was posted as a preprint and subsequently revised after much helpful community feedback. The key purpose was to demonstrate that the impact factor is a poor metric for the evaluation of individual research articles because of the broad distribution of citations that are seen in any journal. Along similar lines, eLife joined forces later in the year with the Wikimedia Foundation, PLOS and others to make the case to release all citation data into the public domain. At the outset, around 1% of this data was public - once the Initiative for Open Citations (I4OC) was publicly launched in April 2017, that number had increased to over 40%. The open availability of citation data will enable new citation-based metrics to be explored and developed. Policy development amongst funders, institutions and governments is perhaps the strongest indicator that open science practices will be adopted in the coming years. It is particularly noteworthy that the European Commission has shown very strong commitment to open science and open access at the European level. Reflecting our growing reputation for high scientific standards and innovation, eLife was represented at several European discussions over the course of 2016. In 2016, eLife was elected to the Board of Crossref and continues to support organisations that promote open science practices, including OASPA and FORCE11. We at eLife believe there is much to be gained by making science a more open enterprise. Whether we are talking about published articles, preprints, peer review reports, data, resources, or methods, the open availability of these contributions to science will help everyone to build on and learn from them. We also think it is important that we conduct our own work in a similar way, which is why we provide data about the journal and have collaborated with Federico Vaggi to generate and publish findings about certain aspects of the eLife peer review process. We are currently exploring further collaborations with researchers to look at other aspects of the peer review process at eLife in particular around the consultation that goes on amongst the reviewers and editors. Once reviewers have submitted their reports their identities are revealed to one another and they can discuss their recommendations. We believe that this results in a more constructive and collegiate process for everyone and we should have enough data now to test this assertion. In other areas of eLife we are also aiming to be transparent. An important example was provided in two articles we published in 2016 that summarised the costs of publishing at eLife and how we planned to set a publication fee, for introduction in 2017. We explained that the fees would help to cover the additional costs of publishing as eLife continues to grow, but that the fixed costs, for example of technology and product development, would be covered by funder support at least for the next 5 years. The response was constructive and supportive. The effect on submissions has been modest and at that time of writing, submissions are back to the levels before the introduction of fees. Looking ahead, we will continue to be as open as possible with our work so that the researchers and funders who support eLife can make their own judgments about how that support is being used for the good of science. 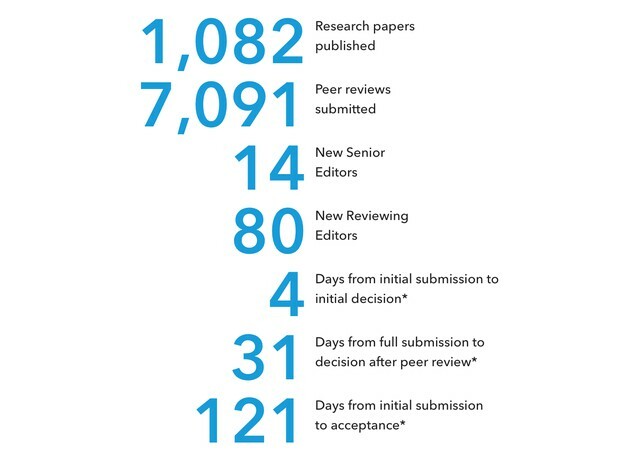 Ever since eLife received the first submissions, there has been a focus on reform of the editorial and peer review process. The goal has been to provide authors with constructive and sound feedback, regardless of whether the editors feel that the work should be encouraged for further consideration or does not meet the standard expected for eLife. We want the editorial experience at eLife to establish a new paradigm for the interaction between authors, reviewers and editors. The work that reviewers and editors put into the evaluation of new submissions should also be recognised for what it is - an essential contribution to science. Towards that end, we encourage all reviewers to register their peer review activity using Publons or ORCID, and we continue to advocate for reform in research assessment to take account of these (and many other) contributions. We want the editorial experience at eLife to establish a new paradigm for the interaction between authors, reviewers and editors. eLife also piloted a small number of peer review workshops in 2016 aimed particularly at the post-doctoral community. We were enormously grateful to the eLife editors (Anna Akhmanova and Andrew King) who helped to facilitate these sessions. The popularity of the workshops suggests that there is great potential for collaboration in peer review training. We are convinced that there are further changes that could help to improve the peer review process. In a survey conducted during 2016, where we received responses from >1,000 eLife reviewers, 95% felt that the consultation process is valuable to authors, and 90% felt that the transparency between reviewers is beneficial to the process. We are encouraging reviewers to reveal their identity to authors and this number has now increased to 38% for accepted article. Such openness will also help reviewers to gain some credit for their reviewing activity. In the longer term, eLife aims to catalyse widespread improvements in research communication, so that we can help to encourage and recognise the most responsible behaviours in science. Working with and supporting the early-career research community will be essential if we are to achieve these goals. Early-career researchers are the future leaders and many are eager for reform of incentive and reward systems so that research can become a more collaborative and open enterprise. During 2016, we continued to work closely with the eLife’s Early-Career Advisory Group and laid the foundations for our first elections to the Group in 2017. One new initiative inspired by the Group was to recruit early-career researchers to our pool of reviewers. eLife’s collaborative peer review process provides an ideal opportunity for early-career researchers to share their views and discuss them with more experienced colleagues. Dozens of early-career researchers have already benefited from this experience, and we plan to build a large community of new peer reviewers in this way. In addition to our work on peer review, we awarded 10 travel grants in 2016 to help early-career researchers attend their scientific meeting of choice, we started a series of regular webinars on topics relevant to early-career researchers (such as preprints and how to gain an independent position) and we published a number of interviews about the careers of researchers who have moved on from academic research positions to new walks of life. eLife’s connection with the early-career community is developing well and we invite all researchers to sign up to our newsletter and consult the new eLife Community page for the latest information. On Jan 6, 2015, Eve Marder and Vivek Malhotra published an editorial that described the kinds of qualities the editors look for in the research articles they wish to publish. …suggested that being anxious could be good for you in a crisis. El Zein, Wyart and Grèzes recorded brain activity in healthy human volunteers as they examined angry and fearful facial expressions. They discovered that social threats can alter brain activity rapidly, and in a more selective manner than previously believed, possibly explaining our 'sixth sense' for danger. ...revealed how bacterial cells see their world in a similar way to us. Schuergers et al. tracked how Synechocystis moved in response to different light conditions, and found that the secret of “vision” in these cyanobacteria is that the cells act as the equivalent of a microscopic eyeball, or the world’s oldest and smallest camera eye, to steer towards the light. ...challenged the view that the brain is divided into separate areas, each of which processes a specific sense. Siuda-Krzywicka, Bola et al. taught a group of healthy, sighted people to read Braille by touch. Monitoring changes in the brain during the activity, they found that the visual cortex was activated, rather than the tactile cortex as expected, showing that we can supercharge our brains to be more flexible. ...mapped the global environmental suitability for the spread of Zika virus. Messina et al. produced a fine-scale map of Zika virus transmission and found that a large portion of global tropical and subtropical regions, inhabited by over 2.17 billion people, have highly suitable environmental conditions and are at the greatest risk. ...identified a new and inexpensive technique for mass-producing the main ingredient in the most effective treatment for malaria, artemisinin. Fuentes et al. developed an approach to transfer many of the Artemisia annua genes involved in artemisinin production into tobacco plants, allowing for much higher yields of artemisinic acid. ...provided substantial insight into the global heights of young adult men and women over a century. The NCD Risk Factor Collaboration used data from most countries in the world to track height among young adults between 1914 and 2014, revealing, among other findings, that Dutch men and Latvian women are the tallest on the planet. ...revealed how the brain can be tricked into feeling disembodied from a body part and given a sense of ownership over a fake one. Della Gatta, Garbarini et al. conducted the rubber hand illusion, where subjects watch a lifelike rubber hand being touched while their own hand, hidden from view, is touched at the same time, leading to a sense of ownership over the rubber hand. Using magnetic fields to stimulate nerve cells in the brain during the illusion, the researchers discovered that the brain loses some sense of control over movement in the real hand and stops considering it as part of the body. ...hinted at the social behaviour of a 3.66-million-year-old human ancestor. Masao et al. discovered new footprints in Laetoli, Tanzania, belonging to two members of Australopithecus afarensis, the same species as the famous fossil Lucy. The footprints indicate significant differences in body size among the species and could suggest that the males had more than one female mate. Within the publishing activity, the major spending areas were broadly the same as last year. 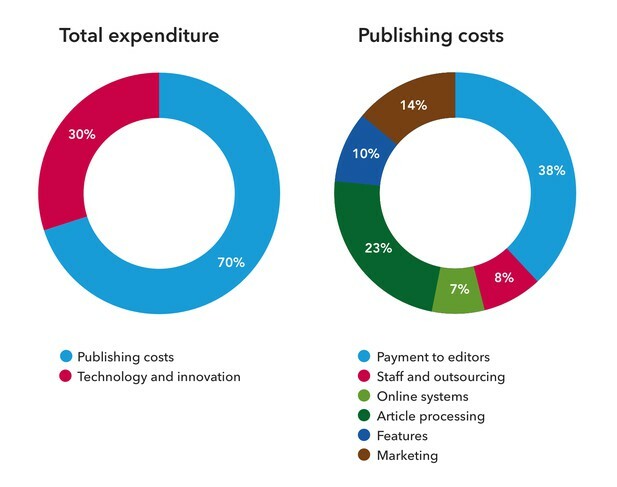 The largest change is that the proportion of publishing costs that was spent on payments to editors increased from 33% in 2015 to 38% in 2016. This was due to the movement in the exchange rate mid-year, as our editors are our largest US$ based cost. Spending on innovation and technology increased from 22% to 30% of our total costs, due to our investment in the development of eLife Continuum.